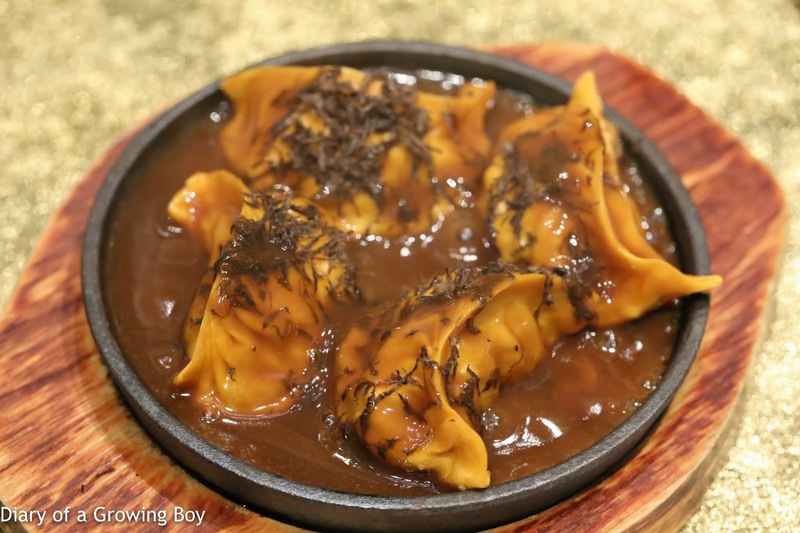 吃喝玩樂 - Diary of a Growing Boy: Boys' weekend in Macau: the next 3-star? 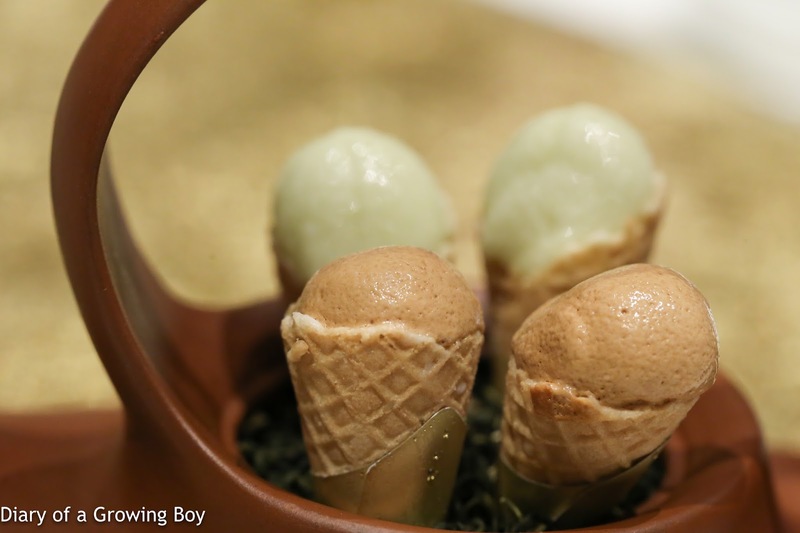 It's been almost two years since I last stepped foot inside Jade Dragon (譽瓏軒) in the City of Dreams (新濠天地), an establishment beloved by the foodie media crowd. 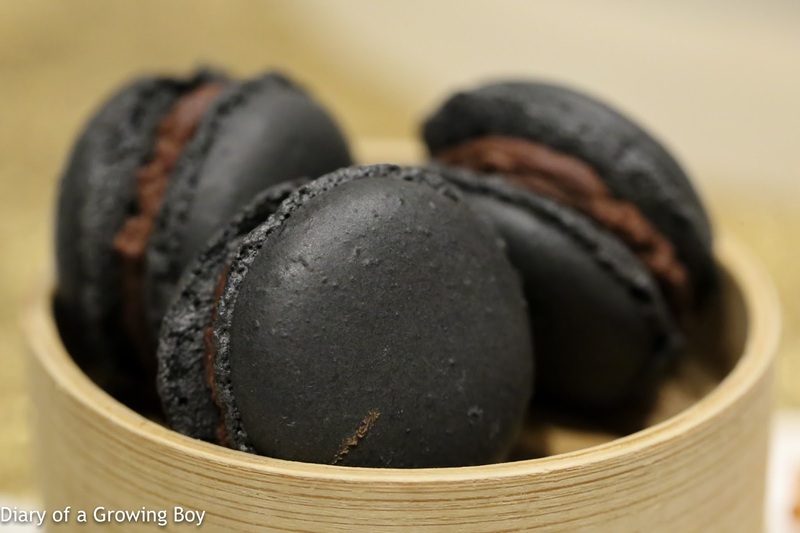 While I have enjoyed both of my previous dinners there, I have always considered it a solid 2-macaron... and a notch below my favorite Cantonese 3-macaron The 8 (8餐廳). That view is need of some drastic revision. I figured we should take it a little easier today, having done two long meals at 3-macaron establishments yesterday. 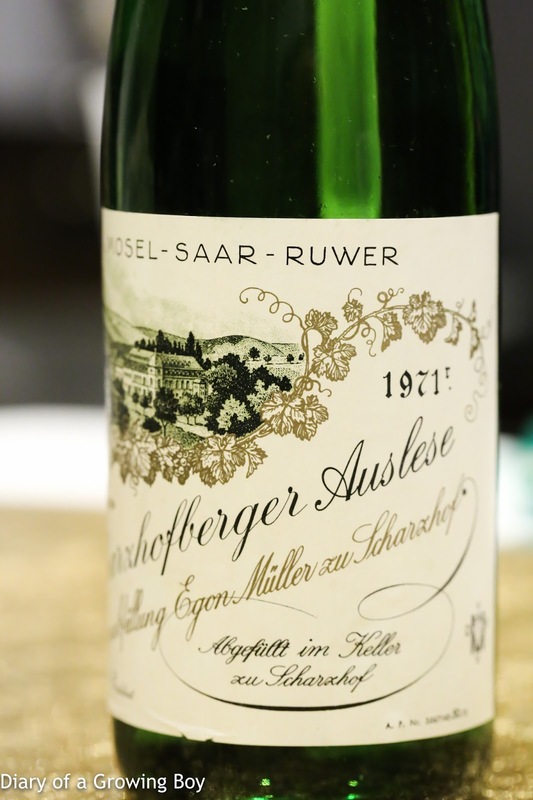 While there are other places in Macau I enjoy dining at, taking The Dining Austrian to Jade Dragon for some more high-end Cantonese just seemed to make more sense. And since I was dragging three other boys all the way to Macau, I figured they deserved a little VIP treatment... so I contacted the PR team to help with the arrangements. Chef Tam Kwok Fung (譚國峰) had put together a menu for us, and we also decided to add on a couple of items which I felt we couldn't do without. 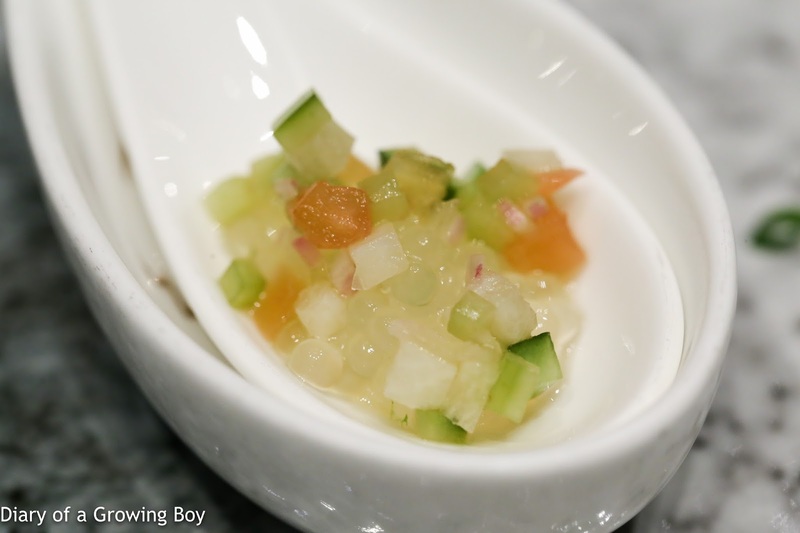 Sago salsa - a refreshing bite to start with. 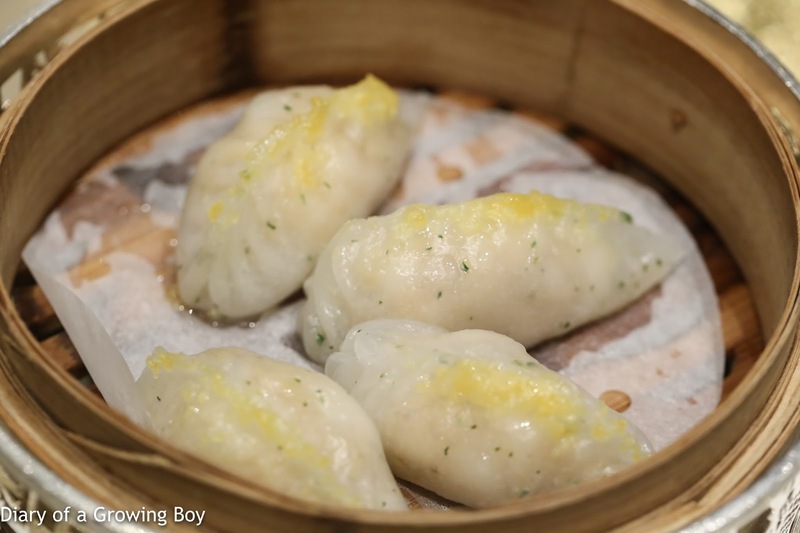 Jade Dragon dumpling (翡翠玉龍餃) - instead of the usual shrimp har gau (蝦餃), the filling was actually homard bleu. 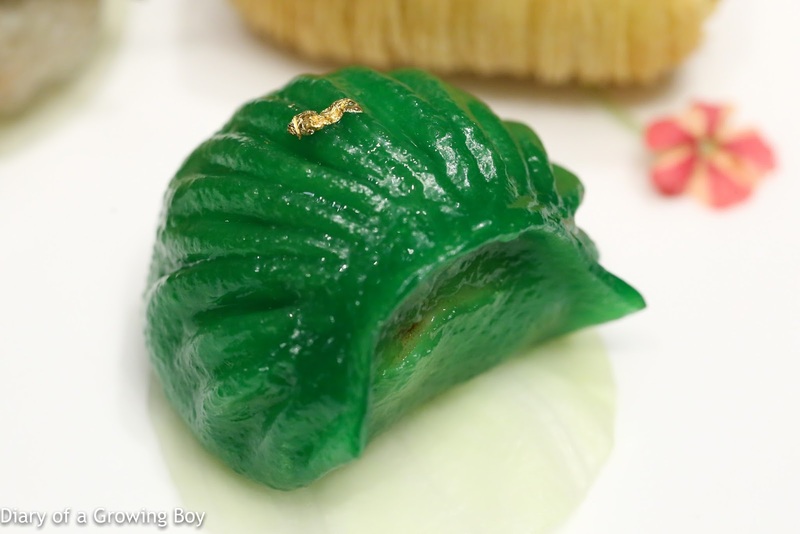 The wrapper was dyed green with the color from Chinese chives (韮菜), and it did look like a piece of jade. Oh, and this was delicious. 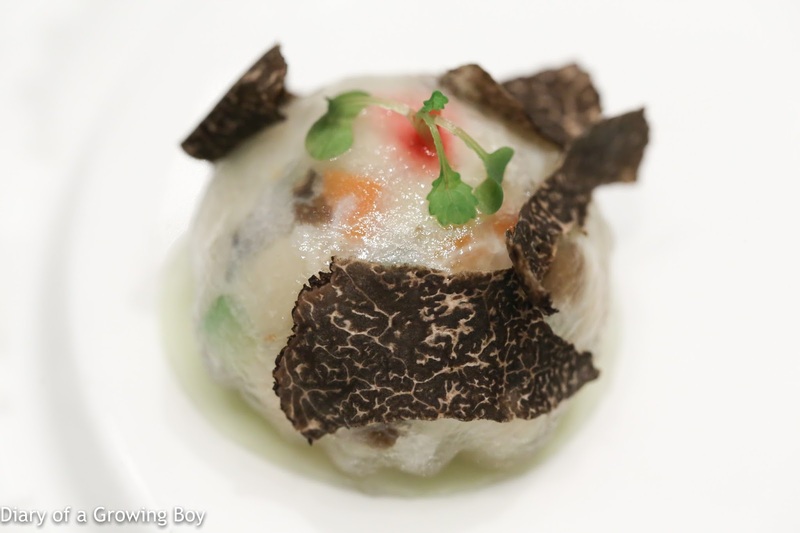 Steamed truffle crabmeat dumpling (水晶松露蟹粉餜) - this was very, very good. 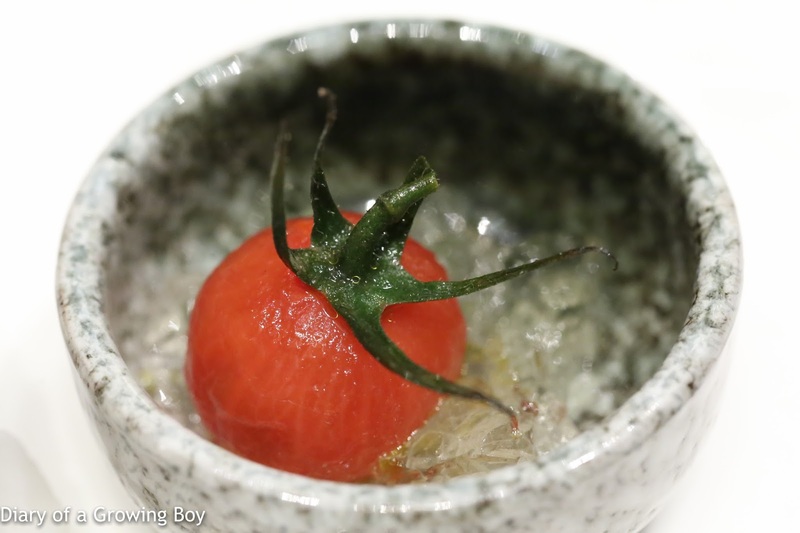 The flavors of the crab meat were pretty intense, and vegetable fillings included carrot, water chestnut, mushroom, and zucchini. Of course the black truffle slices on top were very fragrant. 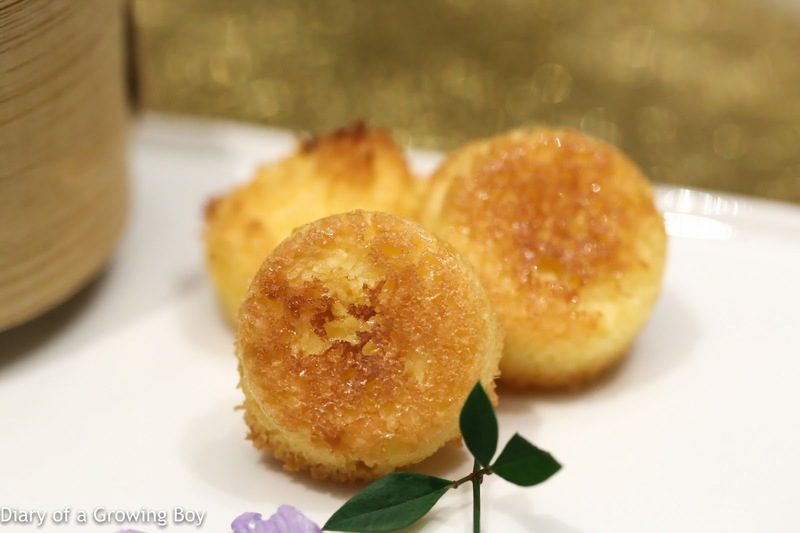 Baked turnip puffs with Yunnan ham (金腿法國蘿蔔絲酥) - very nicely done. 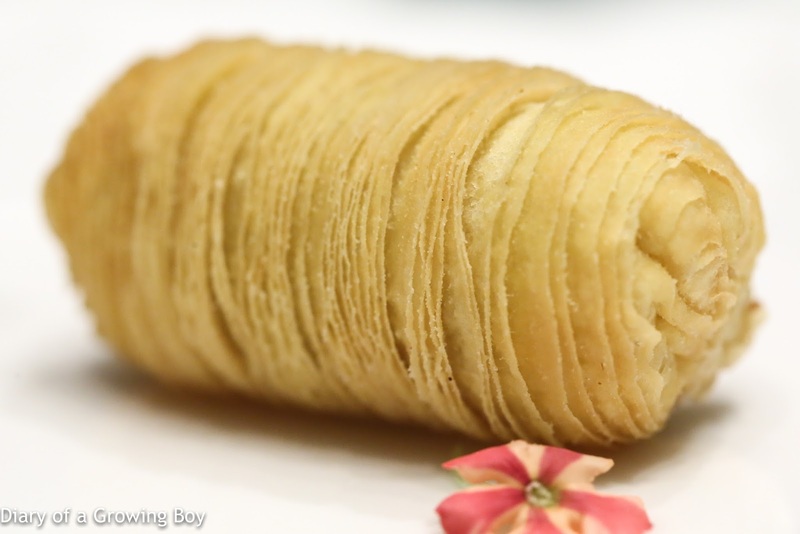 Crispy puff with a molten, tasty filling. Always one of my favorite dim sum items. Steamed scallop and crystal noodles dumpling with "Si Chuan" style (銀絲鮮帶子餃) - pretty nice, with a hint of Sichuan peppercorns. Traditional "Shunde" fish soup with julienne vegetables (順德家鄉拆魚羮) - we had a choice of soup, and The Dining Austrian asked the manager for a recommendation. When the response came back as "most foreigners would choose the hot and sour soup..." my friend knew to go in the opposite direction. This was very, very good. 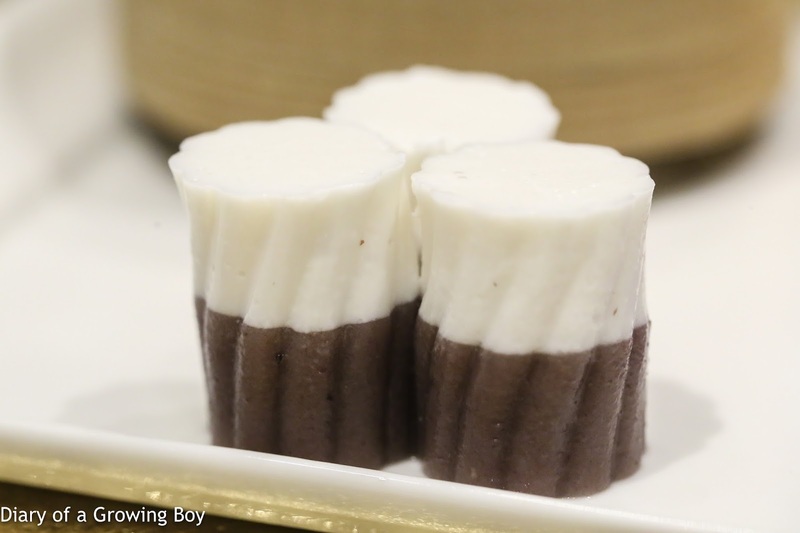 The texture was thick and milky, with lots of collagen. 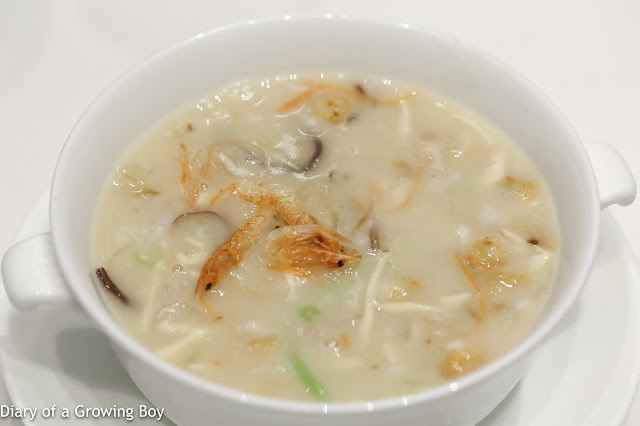 There was a good amount of white pepper to neutralize the "fishy" flavors, and we also had wood ear fungus, sakura shrimp (桜海老), glass vermicelli, julienned carrots and zucchini, and fish maw. 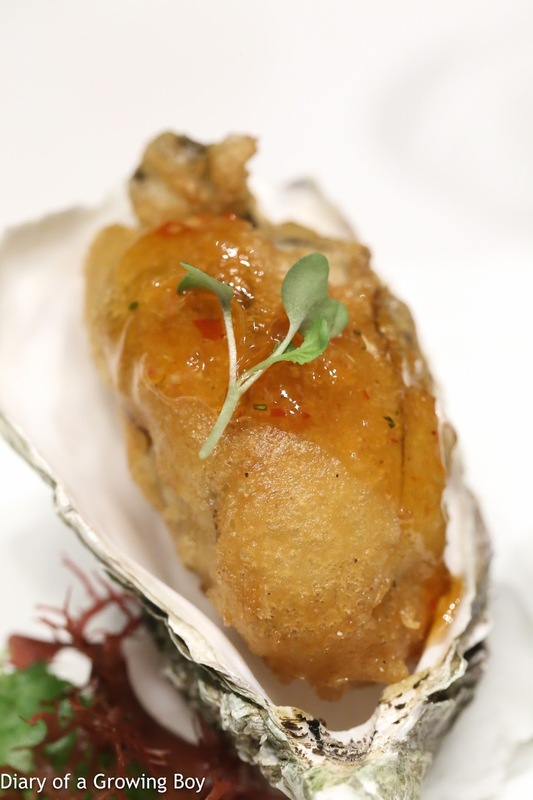 Signature deep-fried Gillardeau oyster (酥炸法國生蠔) - this was indeed one of Chef Tam's signatures, and dare I say this was the best out of the three times I've had it. The batter just seemed even better today. 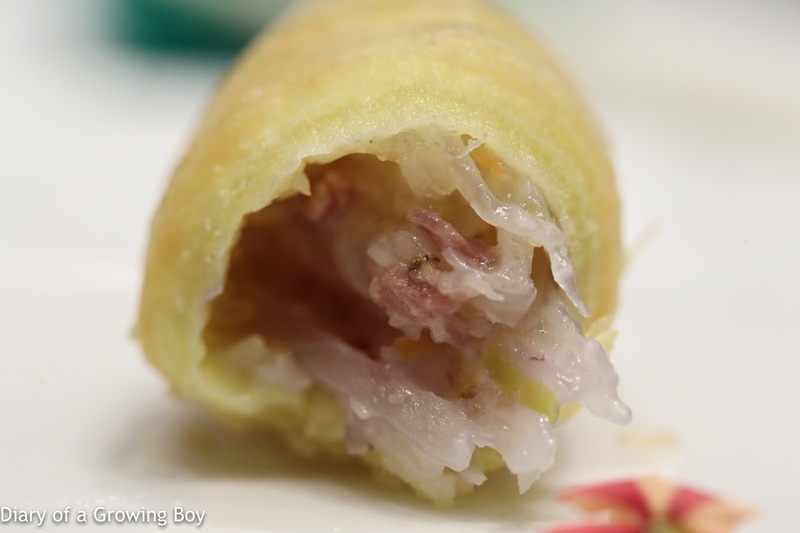 Crispy sea cucumber filled with shrimp paste (百花炸遼參) - interesting that we were told the filling was octopus... In any case, this was pretty tasty, too. 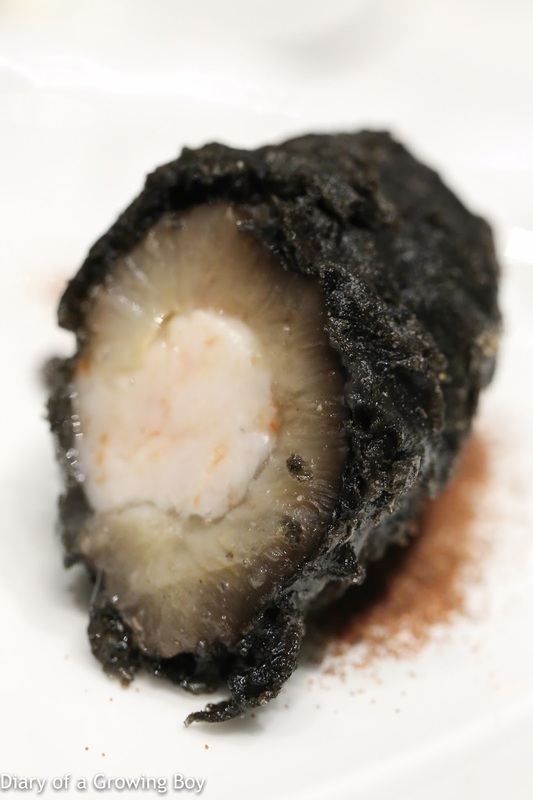 The crispy batter was dyed with squid ink, and this came with a sprinkle of shrimp roe on the bottom. Suckling pig filled with pila (金陵乳豬飯) - this has been creating quite a buzz in the last few months, and even became the topic of an argument between a few people. 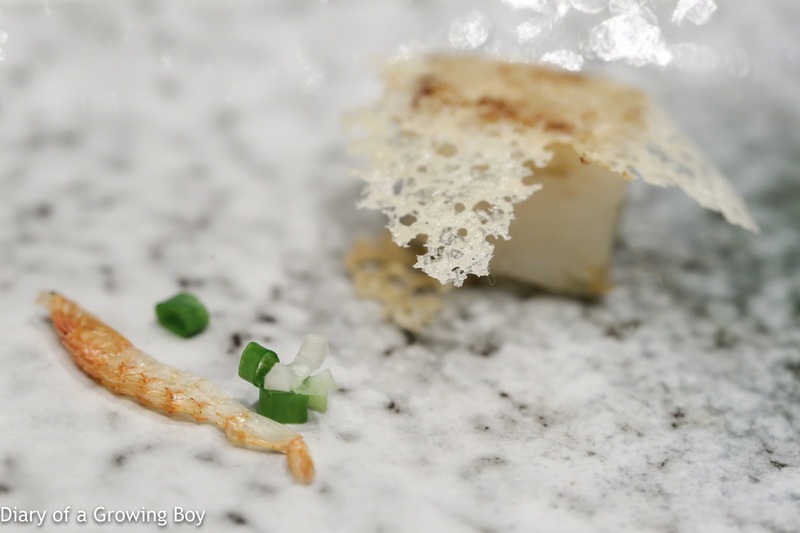 The origin of the dish goes back about a decade or so, when Chef Joe Chan (陳勇) was still in the kitchen at the Kimberley Restaurant (君怡閣). This had been my favorite suckling pig for about 5 years, until they changed the recipe and fucked it all up. Chef Tam also uses suckling pigs from Vietnam, but here he has been a slight but important modification. 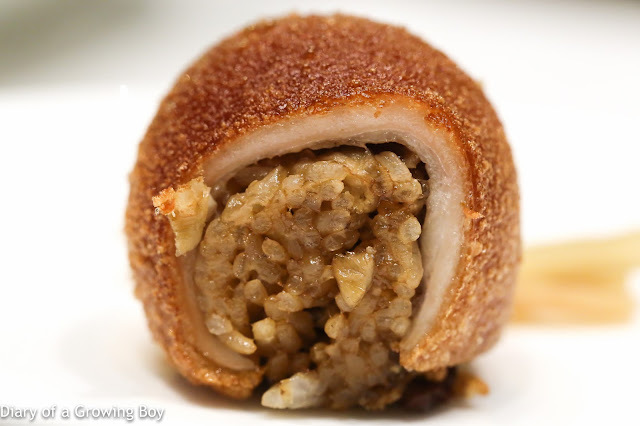 He decided to cut the piggy in half length-wise, and made smaller rolls when stuffing with stir-fried glutinous rice. This changes the crackling to rice ratio, and not only does it become less filling thanks to a smaller amount of rice, the balance and sensation also changes drastically. Chef Tam commented that we got lucky today due to a couple of factors - the thickness of the pig's skin and fat was just right; and the rice had been left to dry for the right amount of time after stir-frying before being stuffed. Our verdict? 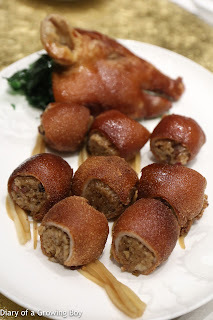 Yes, it's better than what I used to have at Kimberley Restaurant, and certainly better than what I had at Imperial Treasure Fine Chinese Cuisine (御寶軒). This - right here, right now - IS THE KING. 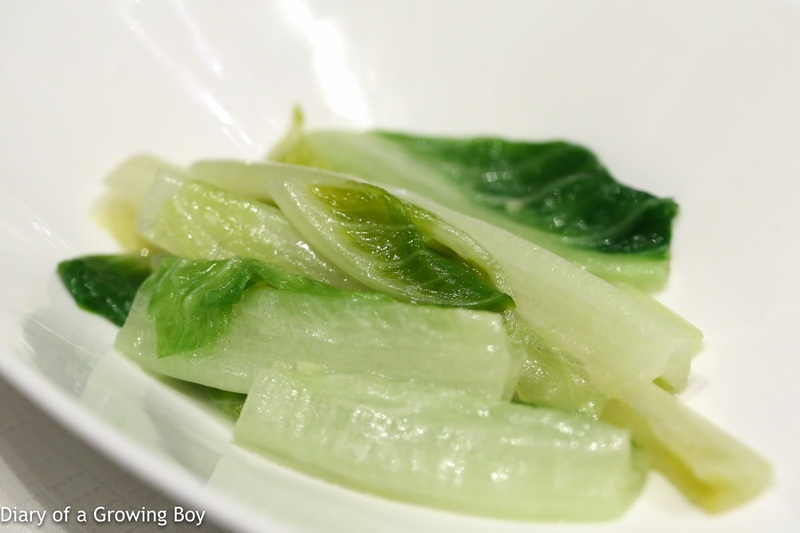 Sautéed Romaine lettuce with ginger sauce (薑汁羅馬生菜) - this was quite a bit saltier than I had expected. 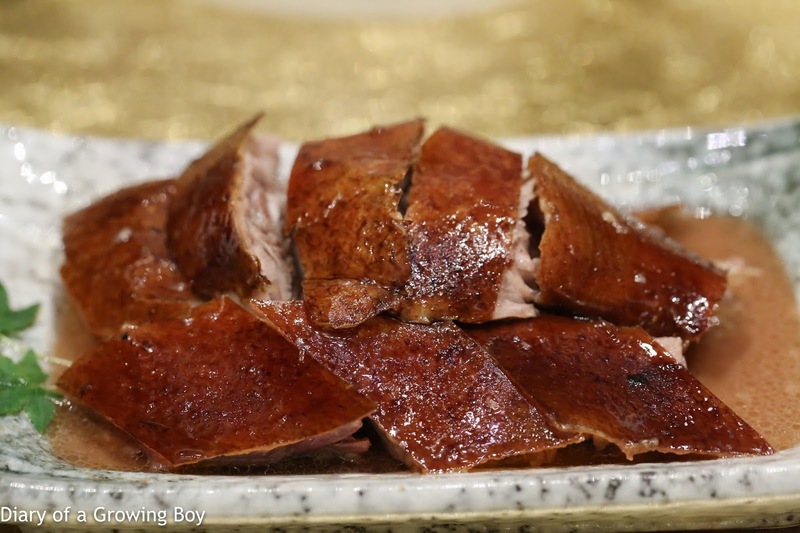 Lychee wood roasted goose (果木燒鵝) - this was very good. Loved the crispy skin. 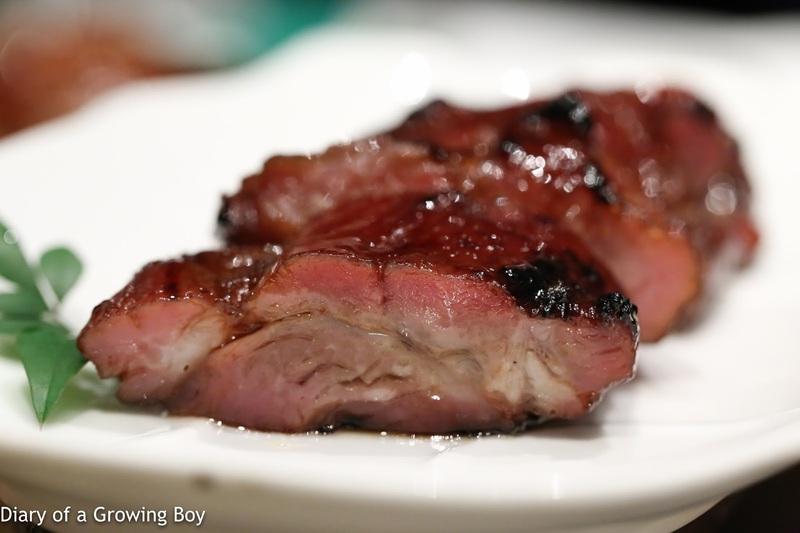 Jade Dragon prime-cut barbecue Iberico pork collar (譽瓏蜜汁西班牙黑豚梅頭叉燒) - this came with a nice and smoky flavor, and not surprisingly the texture was very tender... in fact it was very springy and bouncy. Delicious. We were surprised that we weren't served the Iberico pluma, but according to Chef Tam the Mainland Chinese had bought up the entire stock from his supplier! So he had about 100kg of it on order, but we wouldn't get to have it today. We had a choice of desserts, and I picked the chilled sesamisu (麻蓉芝士木糠布甸) out of curiosity. 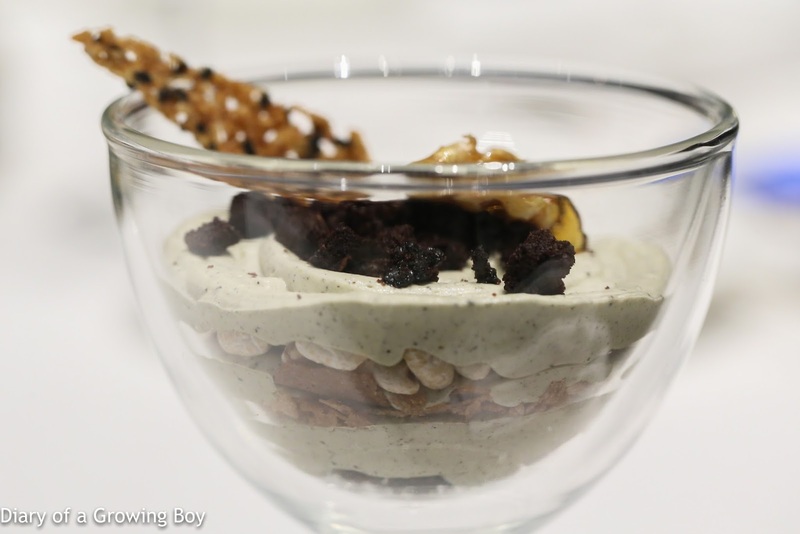 I guess it's a cross between serradura and tiramisu, made with black sesame. Not bad. 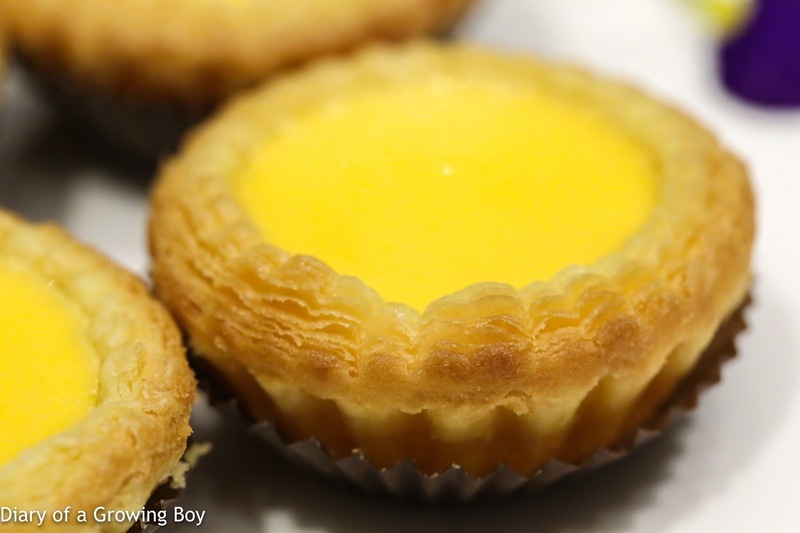 Mini egg tarts (迷你蛋撻) - very nice, with lots of layers in the puff pastry crust. 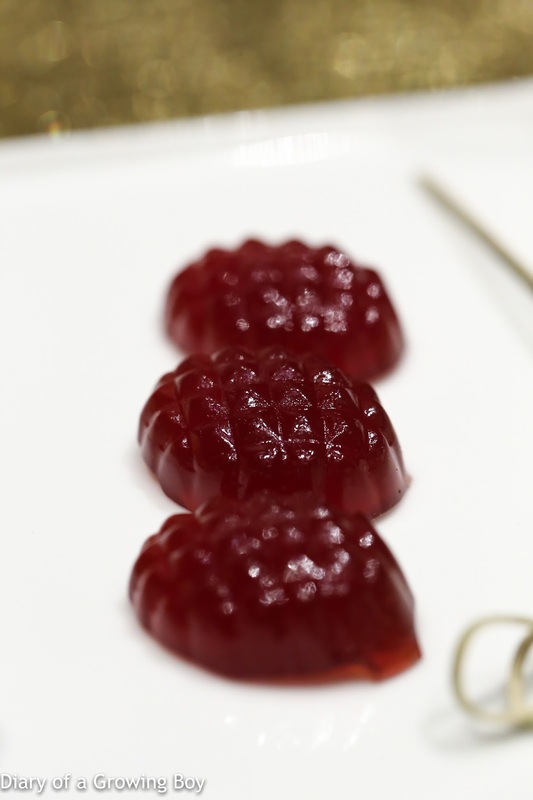 Chef Tam also brought out a couple of extra portions of dessert so that we could have a variety... 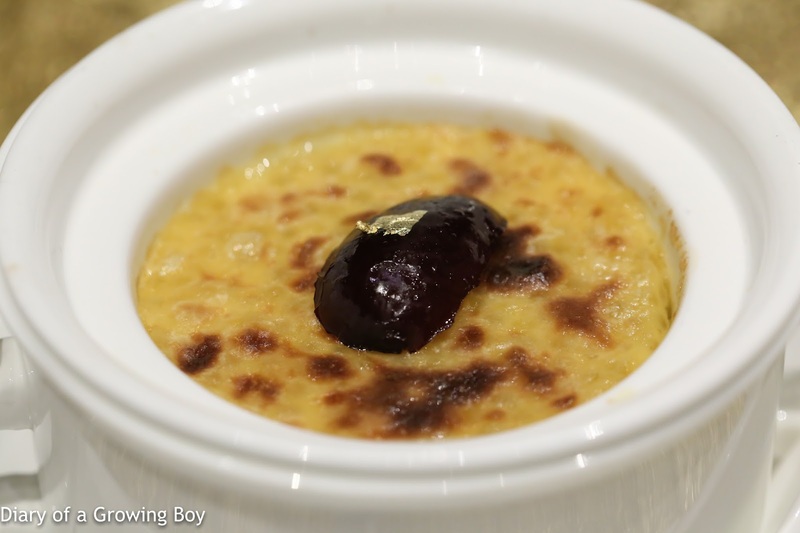 I had a few spoonfuls of baked lotus paste and sago pudding (蓮蓉西米焗布甸). Salted plum macarons - with chocolate ganache. Knowing my penchant for a tipple with my meal, the restaurant had very kindly agreed to waive corkage for me on 2 bottles of wine. 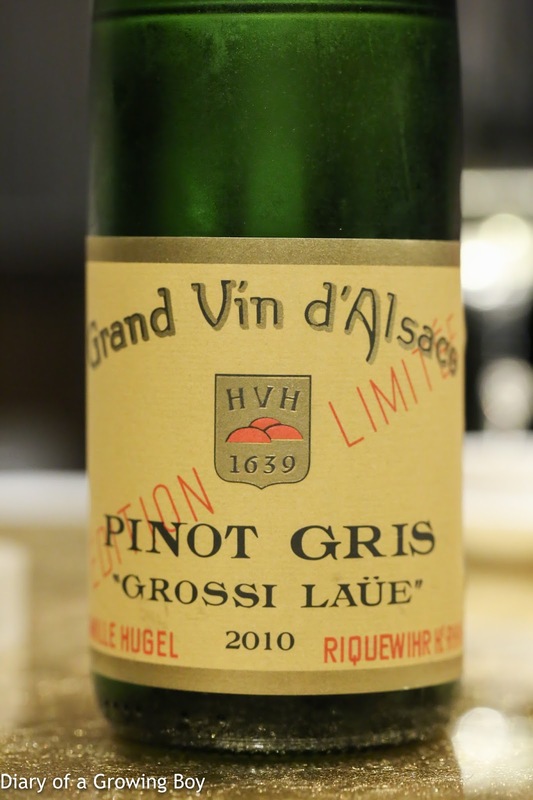 I only managed to bring one bottle, so we ordered the first bottle off the restaurant's wine list. This was a revelation. All of us enjoyed our meal immensely, and at least 3 of us felt that the cuisine here was on a higher level compared to what we had at The 8 yesterday. At least 3 of us considered this to be worthy of 3 macarons - myself included. While the restaurant wasn't upgraded when the 2018 guide was announced 2 months ago, it will be interesting to see if, in the coming year, the inspectors manage to see what we see. Many thanks to Chef Tam and the team for taking excellent care of us.